In response to a desperate SOS, Kadi Hopkirk flies to the African country of Ubangiba, where her childhood friend, Sammat, is soon to be crowned king. Mrs. Pollifax, reluctant to allow the girl to venture alone into what she fears may be grave danger, crashes the party. On arrival, Kadi and Mrs. P. soon discover that Sammat has dangerous enemies. Rumors are springing up that he is a sorcerer who is responsible for a rash of shocking murders in which the victims appear to have been clawed to death by a lion. These crimes are especially terrifying because there are no lions in Ubangiba. 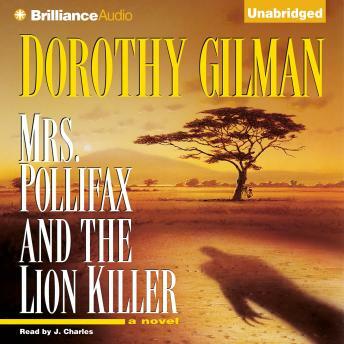 So Mrs. Pollifax wades into the fray, hunting for the source of the bloody terrorism that threatens Sammat and Ubangiba - not to mention Kadi and Mrs. Pollifax. . . .